New features for 2019, SketchUp Pro & LayOut: Now dashed lines are included in layer to facilitate the users to streamline your drawings with compelling drawing communication. With the Tape Measure tool, it is now possible to view exact measurement information where the modeling takes place. It allows the users to model more precisely and more effectively where the work is performed. LayOut: New for 2019, LayOut will notify the users which files are already open to get rid of producing several versions. In both SketchUp and LayOut, significant enhancements are made to .dwg import and export feature. Now, the users can get support for AutoCAD 2018 file format, better accuracy and consistency whereas reducing the loss of data. Now, it is possible to import and export with materials for superior BIM interoperability and workflows. The handshake among SketchUp and LayOut becomes better by producing an “Export for SketchUp” feature for .dwg exporter that transmits all LayOut entities together with any SketchUp viewport data to the model space. Now any filled shape made in LayOut will be bypassed to SketchUp since face ready to be Push/Pulled. Trimble Connect: New BIM BFF, Trimble Connect will offer efficient workflows & cloud collaboration. As a 3D modeling sharing and document management tool, Trimble Connect purposely highlights the projects associated with building design and construction. As a SketchUp (Shop, Pro, Studio or Enterprise) subscriber, you can avail unlimited storage space. 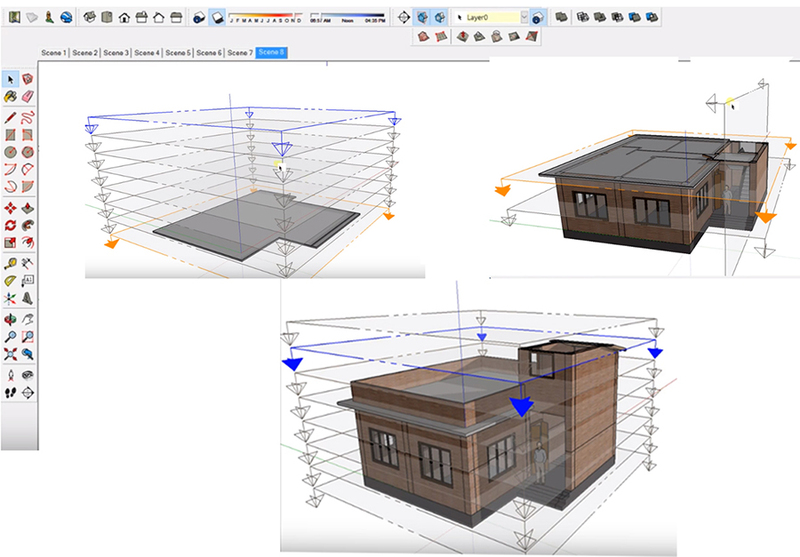 Now, it is possible to apply Trimble Connect to back-up, control versions, and distribute the SketchUp files. Now the users can work efficiently among desktop and web. SketchUp for Web: For all SketchUp users, there will be a ‘live preview’ for image exports. Sign-in to SketchUp for Web, open a model and go to File > Export > PNG. Now, orient or reconstruct any model as per your choice to capture a snapshot at your preferred image size/aspect ratio. This image export can be utilized with scenes to dial-in a composition that facilitates the users to deliver crucial info in your models. Style editing has been included as a feature in Shop, Pro and Studio subscriptions. SketchUp Warehouse is full of different useful extensions that are used in modeling in SketchUp by users but there are 11 extensions which are used frequently. The organization named Fat Pencil Studio uses SketchUp for their all works and among all the other benefits of SketchUp, the plugins which are generally known as SketchUp extensions make the work so great to do. 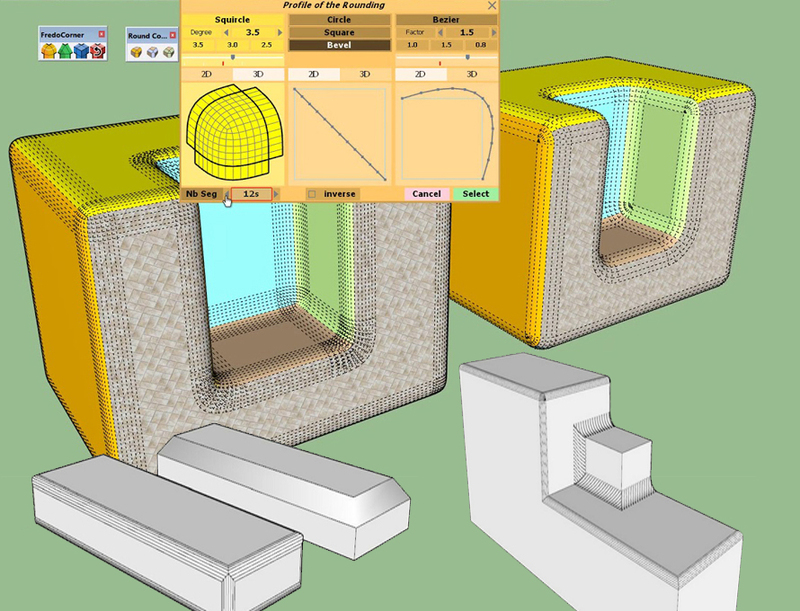 There are lots of extensions or plugins in SketchUp which are used for different reasons and works but the team has chosen 11 great plugins which are best to use for their vast FPS toolbox. This article will cover the plugins and their functions; the plugins or extensions are: Selection Toys, Selection Memory, Weld, Eneroth Camera Memory, Fredo Scale, Architect Tools, Dropgc, Zorro, Wire Tool, Instant Terrain and Loose to Groups. Selection toys: Selection toys is a vital extension for all modelers and for any kind of modeling that allows the users to filter objects in and out of a previous selection. Users can both select and deselect only edges, groups, components or entities that have particular properties such as hidden, soft or smooth etc. the people of Fat pencil Studio, use this extension very much in a variety of ways like for hiding bounding edges, optionally applying materials and more. Selection Memory: This extension helps users in remembering the selections made in SketchUp so people will not miss any selection for any model or size. Weld: This extension adds the loose edges into a soft curve that can be selected in one click; Fat Pencil Studio uses this tool to prevent extra popping up edges while working with Push/Pull tool on traced geometry. Actually much long arrays will need an extra application of the extension and Weld is expert on this. Eneroth Camera Memory: This is a wonderful extension that captures camera views from one model to another allowing remembering the users easily; basically it is a great idea while working between versions of models and wants to copy scenes. When the both models remain opened, it captures the view from the first model and choose “Put to Memory” option and in the working model, users can select “Retrieve from memory” to bring up the view. Fredo Scale: It helps to sale normally with the help of native tools in SketchUp. Architect Tools: This is a set of tools that comes in easy working on large models with buildings and terrain while the “flatten selection” tool helps to tracing the edges easily. There are two more tools like the “Contour Tool” and the “Project Down Tool”. DROPGC: It is a shortcut for dropping objects to a contoured surface and DropGC will create the PathCopy extension and fall cleanly onto a piece of terrain. ZORRO: It is a wonderful tool to cut the fat and makes it easy to chop off geometry around the edges of the model which don’t need to enter into components. Wire Tool: It works greatly on drawing catenary curves. Instant Terrain: It hangs a continuous, triangulated surface over everything; selecting into surface and using Selection Toys will garb the lines only. Loose to Groups: This helps to gain the geometry by ungrouping it and organizing it in something useful. The Stack Rock Group is focused on delivering wonderful projects to the world and in their every project they are using SketchUp that makes their work easier. Trevor Ball is a designer and partner at Stack Rock Group, around 10 years earlier he was given free reign to choose a 3D modeler for making architecture designs and he chose SketchUp. After that in these 10 years he has become the lead 3D designer, Trevor and his team use SketchUp for all of their visualization projects. He has given an interview to Caroline Early where he has shared a lot about his company and his work, this article is just a little description of that conversation. A little about Stock Rock Group: It is an eccentric and creative Landscape Architecture firm based in Boise, Idaho and they are creative idealists who can see every kind of possibilities. They usually set foundation of project with skillful and right questions that help their clients to clarify their personal and business goals, needs, wants and desires etc. Usually the group guides general contractors, construction managers, homeowners, landscape and building contractors, building architects, real estate developers, corporations, institutions, municipalities, wineries and vineyards through their individual attention and detail excursion for every project. Their collaborative, thoughtful process helps clients to grow their businesses, project sustainability and grows many more positive impacts on their environment. 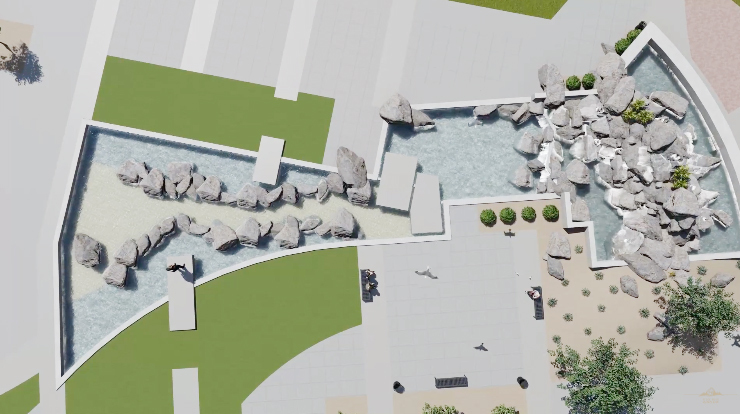 Stock Rock Group is also called a “SketchUp Firm” as all the landscape architects knows that it is very necessary to express their designs to clients in a decent and culinary way for which they use SketchUp in all their 3D projects for strong visualization. Modeling in 3D also helps their clients to understand fully about the site which gives them the feeling about the final project and also allow the architects to make any further change in the project. SketchUp helps them to import the linework of every concept and model them quickly that helps them to meet the deadlines and client meetings. Reason to become total SketchUp techie: Trevor calls himself ‘total SketchUp nerd’ as he has been working with it since ten years, everyday and he loves SketchUp’s native commands as it gives him the ability to customize toolbars, help to find numerous groundbreaking extensions. According to him, SketchUp has any kind of extension for users for any field and the SketchUp Community forums have some of SketchUp Sages that will answer any asked questions by the users in a record time plus there is also other helpful users and SketchUp team members. The team at Stock Rock Group: Though Trevor and his helpers is a part of a small team which is an 11 members team currently at Stack Rock Group and based in Boise, Idaho but has a growing office in Salt Lake City where they design projects all over the country like from California to Florida and everything in between. All the members know that they have the chance to make this firm exactly the place they want it to be, for which they are very serious and focused on their works. Moreover that, they don’t believe in finding the area f improvement rather they like to improve in every bit of their work. This little team is so dedicated and talented that it can handle a lot of projects around Boise like from small backyard planting, parks to medical and college campus, luxury residential properties, corporate campuses etc. and many more. Some projects handled by the team: One of their main commercial projects was the HP campus located in Boise which is the first Sustainable SITES Initiative certified corporate campus in the world. SITES is the United States’ Green Building Council sustainable rating system for landscapes. This campus is above 200 acres where are 46 acres of moistened turf grass; 36 acres of active farmland etc. This project is like an investment in the local ecosystem services and as a sustainable model for site users and the community that become a huge success. They are continuously focused on taking care their current clients and working on new projects; also unfinished with VR and alternatives rotes for rendering. SketchUp or Google SketchUp is mainly a3D modeling computer program that is used for a broad range of drawing applications used by architects, interior designer, landscape architects, civil and mechanical engineers, film and video game designers also. SketchUp can be getting as a freeware version named SketchUp Make and a paid version with many more extra benefits called SketchUp Pro. 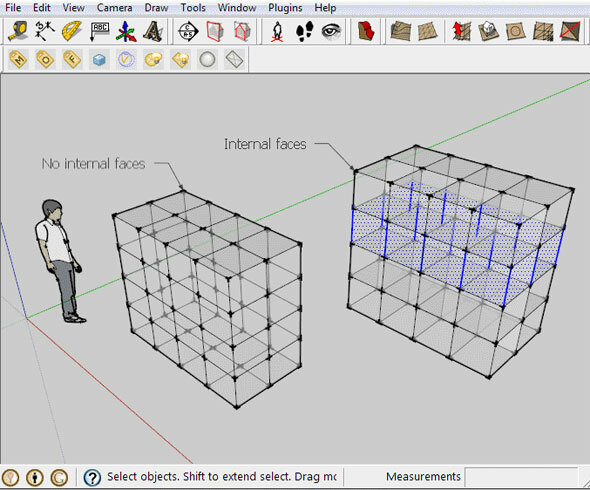 SketchUp is software from Trimble Company and there is an online library of free model congregations and 3D Warehouse to which users can add other models; besides that, the program has drawing layout functionality with variable ‘styles’, supports third-party ‘plug-in’ programs hosted on the Extension Warehouse to supply other abilities and enables placement of its models in Google Earth. As SketchUp users are most of architects, designers, builders, makers and engineers etc. who works hard to give a nice shape to our physical world, they need great tools to do the work. SketchUp is in mission to bring their best to produce some great tools for drawing as drawing is the key thing of the SketchUp users. They draw to search ideas, to identify the things and to show other people their work that they do with love and love to build; SketchUp understands it truly and trying to improve their software day by day. It is a viewer for entity and model attributes. Attributes in SketchUp stand for supplimentary pieces of information which can be preserved with any entity like groups, components, scenes. As for instance, one can preserve a part number, unit price, weight or notes with an entity and read or change that information afterward. All attributes are contained in SketchUp’s report feature. The purpose of this inspector is to retain the user interface small and very organized: Similar to SketchUp’s inspector dialogs, it facilitates the users to choose one or more entities and displays their attributes. By editing the text fields, modifications can be done instantly to the entities. The dialog demonstrates the attribute dictionaries of the drawing elements which are chosen currently. Another component can be chosen with the help of SketchUp’s selection tool. Press the +, ‒ buttons on the left side to include or eliminate a attribute dictionary, and press +, ‒ on the right side to include or eliminate an attribute. Materials: By applying the materials browser and select a material. Attribute Editor will demonstrate the present material (could be not compatible with OS X because of API bug). Layers: Apply the layer manager and verify the radio button of the layer. Scenes: use the scenes manager and double-click the scene (to make it the current scene). This sketchup plug can be accessed from the extension warehouse. SketchUp Bridge Tutorial (3.0) is the newest extension available in extension warehouse. It is compatible with SketchUp 2015, SketchUp 2016, SketchUp 2017, SketchUp 2018, SketchUp 2019. It is developed by the renowned plugin developer Aerilius. It offers an inherent and asynchronous API for delivering message among SketchUp’s Ruby environment and dialogs. Generates a Bridge instance for a UI::WebDialog or UI::HtmlDialog. As an alternative includes the Bridge methods to a UI::WebDialog or UI::HtmlDialog. Registers a callback on the Bridge. This article is going to focus on drawing some Animating sections with scenes in SketchUp and this tutorial is given in the SketchUp for Dummies site. If user has a building with many levels then he/she can create an animated presentation that will show a cutaway plan view of every level. An animated section plane is also used to “get inside” in the models easily and it is an easier act than simply hiding certain parts of it. First of all a section plane has to be added to the created model. Next a scene has to add to the same model. Now another section plane has to add to the model and it can be done in two ways: 1) the Section Plane tool can be used to create a brand-new Section plane and it is fur most the simplest option that makes it right choice for beginners. 2) Or users can use Move tool to copy an existing section plane but make sure that the new section plane is in the active mode which will cut through the model. In case it is inactive, context-click the section plane and select Active Cut from the Context menu. Then another scene has to add to the model which remembers the active section plane. At last the users can view their added scenes through the animations; here one can see an animated section cut as SketchUp transitions from one scene to the next. To enable scene transitions chose Window> Model Info> Animation Panel> check in the Scene Transitions box. Designing a simple pack of chips might sound easier using extensions but it can be also done by using Native Commands; here Aaron used both processes to know the easier one. Aaron Dietzen this time comes with his new useful creation of importing and exporting via SketchUp Shop which is the newest thing for SketchUp users. This article will describe the whole process according to Aaron and his video tutorial where he used two different processes to design a simple pack of chips and there are also tutorial links given below. Aaron Dietzen is mainly seen in various SketchUp Live or any of the Skill Builder videos or been on the SketchUp forum, that means Aaron is fond of SketchUp and serving as a SketchUp employee for two years with more than ten years in the software. He is more than just a simple Trimble employee; he is a true SketchUp fan. He spends his free time in designing things in SketchUp and loves adventurous works. This time Aaron has decided to model something which is a little off the beaten path like a bag of chips using two kinds of tool; native and extensions. The Sand box toolset is a great set of tools helping in modeling things like sandboxes, landscapes etc. and this time this toolset is used to draw a simple bag of chips. 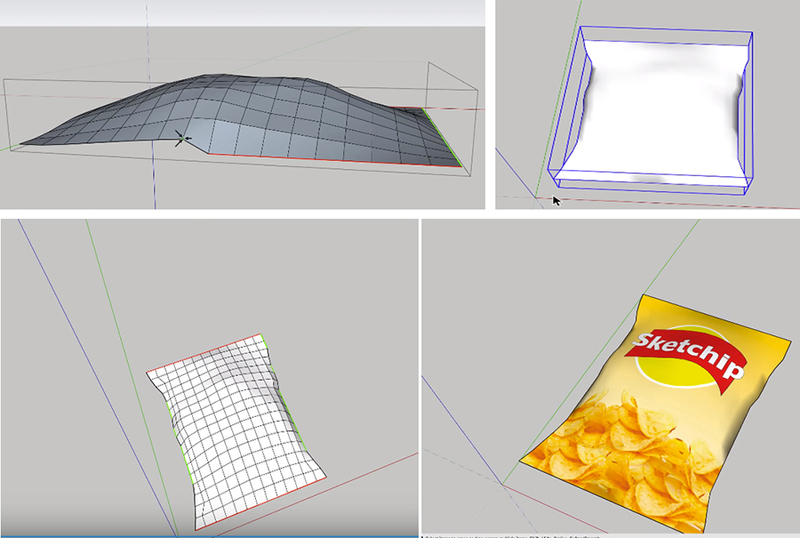 So in the beginning of the model, Aaron opened the SketchUp pro window and at the left side there is the Sandbox toolset; he took the Grade command to draw rectangles representing a bag of chips; next he took the Smooth Tool and as a circle worked on it. Using the Smooth Tool can help to lift the ground base either up or down; he just lifts up the middle portion to give it a loaded packet; next he worked on the edges, actually he at first made the half of the bag and next made exactly other half. These halves are lined perfectly aligned with each other and shaped well; he just copied the half used the move tool and using group tool he flipped the other one. The two halves connected properly without leaving any space between them; it should be keep in mind that a bag of chips is not truly rectangular shape so using sandbox toolset anyone can easily lift or align any corner or line or center to any direction perfectly. To give the sides the exact shape of the chips bag; he used select tool, move them towards center and used smoothing line, clicked triple to make it a whole group. Then he used the paint bucket tool, used Import tool and imports an image of formerly created chips bag and placed it. This time Aaron has modeled the similar packet of chips but used some extensions also like: Soap Buble and Skin from Josef L, Vertex Tools from Thomthom and Fredo Tools from Fredo6. At first he started to draw a regular rectangle shape using normal Rectangle tool; next he selected the geometry and Click on the Generate Skin Button from the Soap Skin option; it actually create a new geometry upon the existing one on which he worked on. Then he selected Grade and clicked the Buble button he entered pressure towards enter that pushed the center of the object, the n he made the exact copy of this half and moved it aside. Next he flipped the other one and placed it upon the previous one; here the edges are aligned perfectly as the Soap Skin option does it already. Now he used Vertex tools to make the crumbles on the sides, smoothened the thing and can paint the whole model using many existed extensions an even can give a name also. FlexTools – FlexPack Pro is the newest sketchup extension that offers responsive 3d modeling with dynamic windows, doors, panels and more. Flex components are developed to accelerate the speed of designing and user-friendliness. Each component can be customized as per your design requirements. 1. Place a Flex component onto a wall component – an opening is formed (with WallCutter). 2. Move it – The opening is modified consequently. 3. Scale it – All the elements of the component are maintained with their exact proportions. 4. Adjust – The setting of the component can be changed anytime. There are several design options to explore with. Watch online demonstration of the plugin by going through the following video tutorial. SketchUp user and Architectural Visualist, Alejandro Soriano has been working with SketchUp from a long time and has discussed about his works and interest in a current interview. This article is dedicated on Alejandro Soriano and his awesome creations, here are some details about the creator and his creations. It is a description of the interview between Alejandro Soriano and Charlotte Shepard. In every city, where the areas are typically metropolitan based people face problems during the living and have to adjust, so Ori, Inc. is working on giving a new form of living in comfort. Aristodimos Komnions is a well known SketchUp user; before joining SketchUp he worked as an Architect-Engineer and Urban Designer for more than ten years. He likes to find new ways of working in every field and is fascinating to imagine the future in a brand new way. So he has taken an interview of the CEO of Ori, Inc; it is a startup dedicated on smart furniture that increases the use of small flats and restricted spaces through shape-shifting practically. Hasier Larrea is the engineer, mastermind and present CEO of Ori who has shared his thoughts with Aris about working with SketchUp on the projects. This article is the brief description of the conversation between them; Hasier has discussed and shared a lot about his works. “Ori” the word derives its name from the word “Origami”, is a Japanese art of folding paper for creating beautiful and extraordinary things; Ori is a prefix for something magical to come; this company is fully informed about lack of interior space, especially in high-density metropolitan innovation places around the world. Places have become too expensive to be stagnant and unresponsive. Ori is inventing something incredible through the help of technology and design that will create lively environments that act and feel as they are virtually bigger. Hasier Larrea, present CEO of Ori is also a mechanical engineer, designer and an eager SketchUp user who has a different thought about managing the living space in the urban area. In his words, urban space has become too valuable to be motionless and unresponsive so it is the right time to authorize people to live large in a small footprint by carrying the robotics world into architecture. Their first launching product is just one little example of a world where furniture will have different roles; in 2017, they had used beta pilots in ten cities across North America and now they are going to deliver commercial systems starting at Boston, New York and DC. 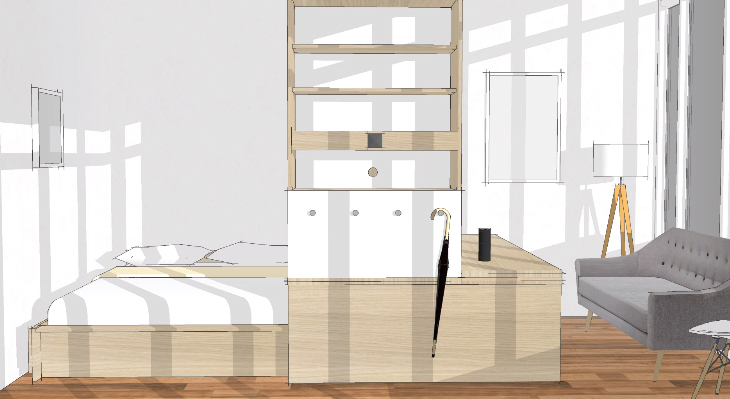 Hasier has learned SketchUp while he was doing his internship in a small design firm in China that developed and fabricated new store ideas for European companies in Shanghai. His first SketchUp model was the store of a German Kitchenware Company and after that he just fell in love with SketchUp, with its smooth process, its tools, easy to handle things everything. While designing he focuses on speed of repetitions and for him it is a main metric in prototyping phases; one can learn more in 5 minutes with a prototype than in 5 weeks of discussions and brain will help to produce much more quickly. SketchUp has helped him in two ways: he can now quickly sketch important concepts of new Ori systems and import models of their existing detailed Ori systems and show them in the context of architectural plans. They mostly use SketchUp for the earliest concept designs in the context of 3D apartments and use those models for internal discussions around whether the concept is right or not. Haiser is a big fan of “Pencil Sketch with Darker Traced Lines” to make some quick models; they also used AutoCAD for furniture manufacturing, SolidWorks or Onshape for mechanical engineering. His favorite tools for quickly prototyping of a new concept are Arduino for electronics, Processing for software development and SketchUp for 3D design. In Ori, everyone is desire to help people seeing them space in a different way and prove that more square footage doesn’t need more functionality and they have created a lot of space in the world that can solve the housing challenge.